Combined, these two forces mean a continuous drain on your utility bills as well as a rotting, decaying crawl space under your home. All of these problems can be helped by simply installing a crawl space vapor barrier, airtight crawl space vent covers and doors, and a crawl space dehumidifier in the space. The installation usually takes less than a day, and the vapor barrier itself comes with a 25-year warranty. Read on to see the steps we take to install a crawl space encapsulation system, or click here to sign up for a Free Estimate and inspection on a crawl space moisture barrier system in your Manitoba home! If you're interested in preventing moisture from seeping upwards from the crawl space walls and floors, it's best to install a rugged, tear-resistant plastic vapor barrier on the crawl space walls and floors in your home. The crawl space vapor barrier installed by BlueMaxx Basement Systems is 20 mil thick and comes with seven layers of polyester cord, high-density polyethylene and low-density polyethylene. The best color for this barrier is white, as it makes the best use of available lighting. To allow a visible area on block walls for termite inspector access, BlueMaxx Basement Systems of MB will also install a clear plastic cap on the tops of the walls, allowing vapor barrier protection while providing an installation that will still allow of inspection. Once the area is sealed off, it's a good idea to install a crawl space dehumidifier. Homes that have had the crawlspaces saturated with humidity will retain some of that moisture in the wood even when the space is encapsulated. 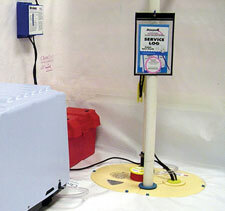 A dehumidifier can dry this out, while making sure that any future moisture is not trapped in the space. The SaniDry™ Crawl Space Dehumidifier, available in Manitoba by BlueMaxx Basement Systems, is a self-draining, powerful design that's ENERGY STAR® Rated and powerful enough to do the job the way you want it to. 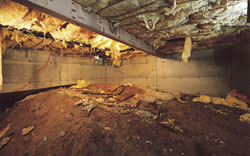 No matter what your needs in your basement or crawl space, BlueMaxx Basement Systems of MB would like to help. 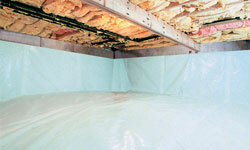 For a free, no-obligation crawl space vapor barrier installation quote, call or e-mail them today! 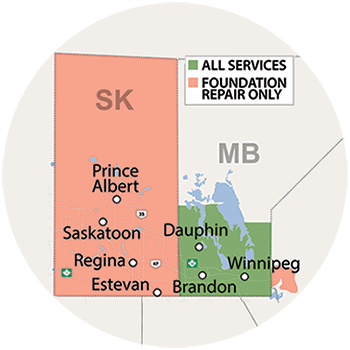 BlueMaxx Basement Systems serves Winnipeg, Arnot, Brandon, Brochet, Dauphin, Island Lake, Little Grand Rapids, Lynn Lake, Melita, Nunalla, Port Nelson, Russell, & Swan River, and many areas nearby.